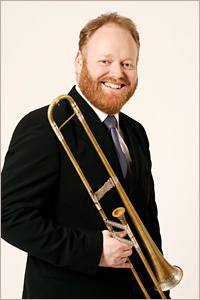 Adam graduated in 1997 from the Royal Academy of Music where he is now a visiting professor of baroque trombone. Adam is a keen exponent of the many guises of historical trombone playing. His enthusiasm has led him to partake in recordings and concerts all over the world with some of today's finest exponents of early music. His work can be heard on over 3 dozen recordings covering a repertoire spanning over 200 years, recent projects have included recording the sonatas of Dario Castello, virtuosic chamber music by Matthias Weckmann, Schmelzer and Biber and early 15th century playing techniques. As well as his work at the Royal Academy or Music in London, Adam teaches regularly on international early music courses including Wim Becu's Academia Giovanni Gabrieli in Belgium and the Newark Early Music Course with Jamie Savan in the UK. He has also taught as a visiting professor at the Royal College of Music in London and given masterclasses in Sweden, Israel, and a course for renaissance brass playing on an organic cattle farm in Southern Germany! Adam is not only active as a teacher of the sackbut but also teaches brass at the British School in Antwerp. Adam is principal trombone with Sir John Eliot Gardiner's English Baroque Soloists and Orchestre Revolutionnaire et Romantique. He is also principal trombone of The Kings Consort with whom he recently performed the Leopold Mozart concerto. Adam's regular chamber music activities include projects as co-artistic director of His Majestys Sagbutts and Cornetts, and as a member of the QuintEssential Sackbut and Cornett Ensemble and the Caecilia-Concert. He is currently part of the production "VSPRS," a ballet based upon Monteverdi's Vespers of 1610 which is touring world-wide with Alain Platel's Ballet C de la B, Oltremontano and Aka Moon in which he is exploiting among other things the possibilities of contemporary jazz improvisation on the sackbut!